The Choose To Move pilot program has approved Prince Rupert’s branch to launch a second round in the fall. Suzanne Buller and Pearl Dashwood are dedicated participants in the Choose To Move program. 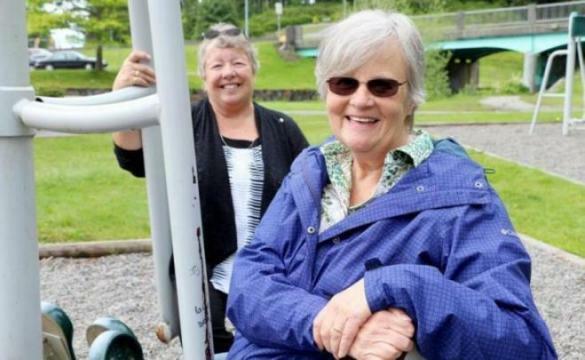 The Choose To Move pilot program, a provincial initiative to encourage older adults to get fit, has approved Prince Rupert’s branch to launch a second round in the fall. Activity coach, Tina Cann, and the Centre for Hip Health and Mobility, affiliated with the University of British Columbia, coordinated the six-month program, which encourages adults 65 years and older to set goals and develop a personal fitness plan. Cann is enthusiastic about how the program is going so far. She needed a minimum of five participants and 12 signed up. The program is almost halfway complete and she has eight dedicated participants sticking to their plan. Two of the participants wanted to share how the program has affected their lives and the choices they make from day-to-day. Pearl Dashwood is a young 70-year-old who found herself in an exercise slump for eight months. She used to go to the gym, but it wasn’t what she was looking for so she stopped. “I thought this was a good way to get started,” she said. Her personal goals centre around being outside. She walks and includes incidental exercising in her program. “I climb hills or take stairs and I set goals when I walk from point A to B rather than doing indoor exercise,” Dashwood said. When it does rain though, she is doing yoga at home, a practice she studied for years. “The whole reason I joined was to have a coach,” she said adding that she likes the gentle push. Suzanne Buller is another one of Cann’s “success stories.” She is a young 68 years and knew at her age she had to get back in shape.